Looking to tame acne? Have uneven skin tone? dry patches? oily skin? dullness? or any other issues? Then the Clarisonic is for you! The Clarisonic was created by the makers of the sonic toothbrush (which I have used for years) and they applied their patented technology to this high-tech cleansing device. Any of those knock-offs on the drugstore shelves will not work to change your skin the way the Clarisonic does. 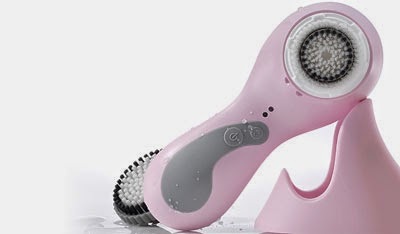 Being at a higher price point ($238 for Clarisonic Plus, $150 for Mia 2, and $125 for Mia), may be a turn off for many and cause them to opt for a cheaper version. But I promise, there is no competition. I personally own the Clarisonic Plus, which enables you to choose from 3 different speeds for the brush head and includes the body brush with arm extension (great for self tanning). I purchased mine from QVC, as I do many of my more expensive beauty products, since they always give you a great value and provide easy pay in most cases. Easy pay allows you to pay off your item over 2-6 months, depending on the promotion. I will often wait for a Today's Special Value (TSV) to make my purchases because the prices are reduced by about 20%. I have always prided myself on maintaining as clear skin as possible. A proper and efficient skin care regime is essential, in my opinion, and is not complete without the Clarisonic. Thanks to the sonic technology, this waterproof device clears out pores in a way that manual washing will never allow. My acne has been minimized without using acne-specific cleaners and it has never dried out my face. I use it both in the morning and at night. In the morning, my face is perfectly prepped for makeup application and at night, I go to sleep knowing my face is the cleanest it can be. The removal of makeup is superb and in turn, my pores have been greatly reduced. With these results, I find that the other skin care products I use absorb better and the cleansers I use are made more effective. It is just a really incredible product and everyone can benefit from it. I even bought my boyfriend, Will, the Mia for Christmas a few years ago and he loves it. The Clarisonic is available at many retailers, such as Sephora, Amazon, Macy's & Nordstroms; however, I would recommend purchasing the Clarisonic Plus from QVC because you get excellent (and costly) face and body cleansers from Philosophy as a bonus. Shipping is also included. If you are interested in trying the Mia or Mia 2, which is smaller and does not allow for 3-speed selection and body brush, but is just as effective, the best place to purchase would be Sephora. You receive free three day shipping and beauty samples with your online order. I highly encourage anyone with skin concerns to try this before resorting to a dermatologist or spending tons of money on topical products to solve your problem. I know the price point is high, but this is an investment in your skin and it will last you a very long time. Maybe its the accountant in me, but even if you got the most expensive version of the Clarisonic, it costs approximately $20 per month over one year's time to use this device. The benefits here definitely outweigh the price! My recommendation, if you are still somewhat skeptical, would be to purchase your Clarisonic from a retailer that has a good return policy, just in case this is not the product for you (but I highly doubt you will return it!). I know QVC has a 30 day return and Sephora has an unlimited return as long as you have the receipt. You can also return in-store to Sephora if you purchased online. Enjoy & Always Know that You Have the Right to Remain Fabulous!